After shaking up the coffee maker market with pod brewing systems, Keurig is now aiming to conquer another caffeinated beverage: Soda. 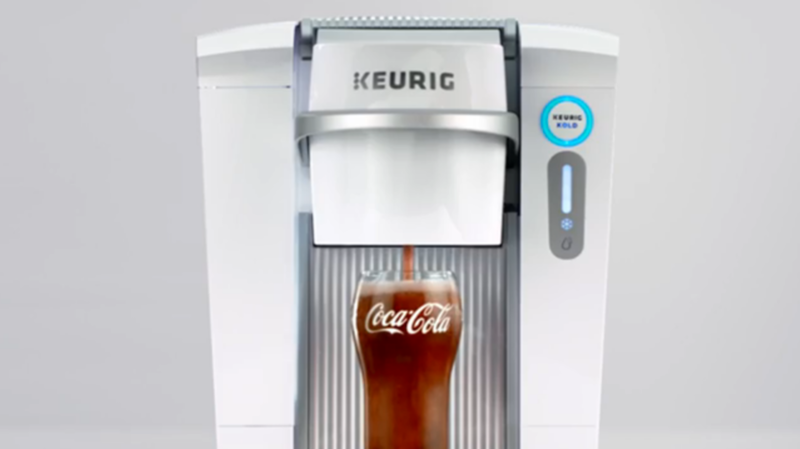 The newly released Keurig Kold will serve up chilled, carbonated soft drinks from big-name pod providers like Coca-Cola and Snapple. Sales of Keurig’s coffee brewers and accessories have plummeted in the past year, and the development of Keurig Kold is part of the company’s push to expand. Though the machine will hardly be the first home soda-making machine to hit the market (SodaStream produces Pepsi drinks using Keurig-style pods), it has a few differences from the competition. Instead of CO2 canisters, each Keurig Kold pod comes with special built-in “Karbonator beads” that generate the beverage's carbon dioxide. This also means that the fountain-style device can just as easily be used to brew iced teas, flavored waters, and other non-carbonated cold drinks. Now, after beginning the day with your Keurig coffee and enjoying some hot chicken soup from a pod for lunch, you can finally relax with a cold cup of Fanta you carbonated yourself.